Class 10 date sheet 2019 is released by the exam conducting body of the respective states. 10th time table 2019 contains the exam dates of all the subjects included in the curriculum of the student of class 10th. Every year lakhs of students appear for class 10th which is also called as SSC examination in some states. Class 10 exams are very crucial as based on the this student can apply for the courses its 12th or higher secondary class which further affects to the career selection of the student. Here on this pages we have listed the 10th Class Exam date Sheet 2019 of all the board that are present in india. So if you are Searching for any specific Exam Date sheet of any specific state board you can get it from here. All the Best for your exam..!! Candidates can check CBSE date sheet for class 10th from the table given below. ICSE Time Table 2019| ICSE 10th Time Table 2019 has been released on the official website. Candidates can check the dates from the table below. Manabadi Andhra Pradesh 10th Class Timetable 2019 is available on the official website. Candidates can check the dates from the table below. Assam HSLC Time Table 2019 for Class 10th or SEBA Exam Routine 2019 has been released. Bihar Board 10th Exam Date 2019 is released by various newspaper but details about BSEB 10th Time Table 2019 is not available on the official website. Even though its not official but we can get an idea about the exam date of 10th class. Image of pdf released by the the newspaper is given below. Chhattisgarh board of secondary education conducts the CG board 10th exams every year and it also releases the CGBSE 10th Time Table on the official website. Goa Board of Secondary and Higher Secondary Education (GBSHSE) is organising body of Goa Board SSC Exams. You can get the expected time table of Goa board class 10 from here. According to GSEB SSC Time Table for the 2018 session, the schedule for class 10 examintion can be checked from the table below. HBSE 10th class date sheet has been released on the official website of the board of secondary education of Haryana website. Expected date for the commencment of Jharkhand 10th class board exam has been given below for refernece purpose only. Karnataka SSLC Time Table 2018 examinations usually hekds in two sessions. The forenoon session, which will be from 9.30 am to 12.30 pm and the afternoon session that will commence at 2:00 pm and end by 5:15 pm. Kerala SSLC Examintion Time Table has been released by the official exam conducting body. As per the official date sheet exam will be conducted on different timings which are 1:45 PM to 4:30 and 1:45 PM to 3:30 PM. 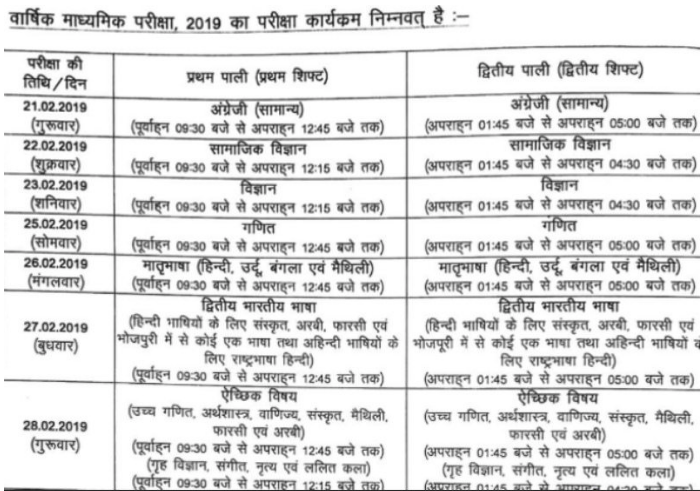 MP board 10th time table 2019 consists of the dates of the examination as well as the timings. MPBSE has not released the 10 class time table once it is released it will be updated here. Click Here to Download Maharashtra SSC Time Table 2019 (Revised Syllabus). HSLC Routine of mizoram board is yet to be announced by the MBSE once the mizoram board class 10 routine is announced same will be updated here. MBOSE HSSLC Routine 2019 for session 2019 has been released on the official website of board meanwhile. Candidates can check the MBOSE Class 10 Routine 2019 from below. Odisha HSC or 10 time table for session 2019 will be released on the official website of odisha board meanwhile you can check the expected schedule from below. Punjab School education board releases the 10 class time table. usually the time table is released one month prior to commencement of exam. RBSE 10th class exam dates 2019 has been declared. get them from the table below. TN Directorate has issued the TN SSLC time table for session 2019 early so that students have enough time to prepare for the exams. Time table has been released and can be checked from the official website or we have provided the table for the same here. Telangana SSC time table not released on the official website. As per the last year trend it is expected that TS SSC date sheet will be released in the 2nd week of December. TBSE will be releasing the time table for class 10 or madhyamik time table on the official website as per the last year details it is expected that the exam will begin from 1st week of March 2019. UP board 10th time table 2019 consists the date and time along with the subject of the exam which will will be conducted. up 10 class time table has been released and we have made it in the table form for you have a look at UP High School Time Table 2019. UK Board 10 class time table is yet to be announced candidates can check the 10 class time from here once it is released on the official website. Date sheet is very important for students who are going to appear for the exam as it provided them the dates on which exam will be conducted. Board released their respective date sheets on their official website which candidates can download by following some simple steps mentioned below. Once you have entered the official website then you have to search of the section which says Time table. In different states class 10 referred with different name like intermediate or high school or Madhyamik etc so you have to check for the make sure you are searching the correct name. Once you get the Link simply Click on that and open the date sheet. Class 10th date sheet will be displayed in PDF or Image form now you to download it and take its print out. There are some of the important instructions which must be kept in mind before appearing for the examinations. So, let’s have a look at them. 10th class date sheet will contain the dates and time of the Exam along with the subject. Candidate must carefully check the day and date properly as per their stream. Date sheet also contains the time slot in which exam will be conducted some time exam is conducted in multiple slots such as morning and evening so make sure to check that. Class10th time table 2019 has been released. Get 10 class date sheet for for various states has been released. Get class 10 exam date or routine from here..